Image caption Protesters carried a large banner in Budapest reading "Putin no! Europe yes!" Some 2,000 people have marched through the Hungarian capital, Budapest, ahead of talks between Prime Minister Viktor Orban and Russian President Vladimir Putin. Tuesday's visit is Mr Putin's first to an EU leader since June 2014. Hungary wants to negotiate a new agreement for Russian gas supplies. Russia has been largely shunned by EU member states because of the conflict in eastern Ukraine, although it denies accusations of fomenting the violence. 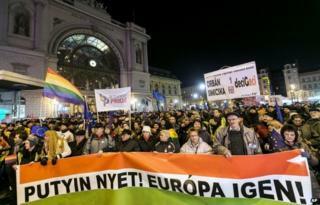 Protesters rallied in Budapest on Monday night carrying banners saying "Putin No! Europe Yes!". Much of the city centre was closed to traffic on Tuesday as security was stepped up ahead of the visit. Mr Putin's trip comes less than a fortnight after German Chancellor Angela Merkel visited Budapest before embarking on a week of intense diplomacy, which resulted in the announcement of a ceasefire in eastern Ukraine. The Russian president is keen to demonstrate that he has allies within the EU and Nato, observers say. During his visit, he is due to visit the graves of Soviet soldiers. Hungary has backed EU sanctions imposed on Russia over the situation in Ukraine, but has been vocal about their negative impact. Last year, Mr Orban said the EU had "shot itself in the foot" by restricting trade with Moscow. Hungary relies on Russia for more than half of its gas supplies and wants to negotiate a flexible long-term deal to succeed the current agreement which expires later this year. Mr Orban, who rose to prominence with a strong anti-communist and anti-Russian stance as a student leader, told Hungarian radio on Friday that there were psychological tensions with Russia, but he wanted to overcome them. He is considered to be among Mr Putin's closest allies in Europe. Many of the demonstrators who marched through Budapest on the eve of Mr Putin's visit said they were wary of closer ties with Russia.